Last summer they showed up looking scary and vicious. They have reddish-brown wings, black bodies with yellow stripes. We thought they were hornets, but they are Cicada Killer Wasps. Last year, they were a nuisance, this year they were a plague of not quite biblical proportions. The male of the species cannot sting. The females are twice the size of the male and they have a wicked sting. They build nests in dirt. 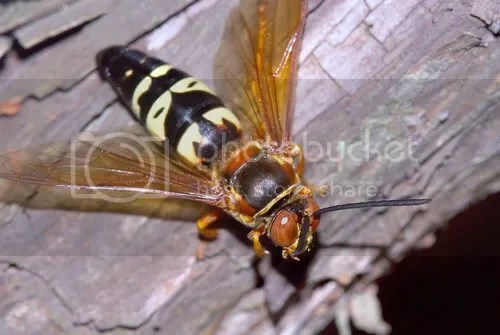 We have a deck in the back yard and they opened the North Texas Cicada Killer Wasp University in our back yard. We couldn’t go out in the back and cook on the grill. The dogs wouldn’t go out and . . . well – you know. I decided it was time to deal with these things. I started first by covering my deck with plastic. I dressed for war – even tied one of those Rambo things on my head. I decided I would gas them. So I pulled the plug on a couple of fogger bombs. They seemed only annoyed by my first assault. I talked to my nephew (a professional exterminator) and he explained how they nest and how to get rid of them. The next step for me was to take the top of the deck off and find the hole that indicates the entrance to their nest. I found it on the first night. I sprayed an entire can of foaming wasp killer inside the hole. The next morning – they were still swarming! I took more of the deck top off and found two more nests. I bombed them as well and the next morning – still swarming! Now I have had enough. I walked into the back yard and did the normal Saturday drill, pick up the dog. . . well – you know. Next, trim along the fence and around the deck. All the while, the wasps are all around me. A few got too close and I tried to do the Light Saber bit with the weed whacker, but it’s too cumbersome to be an effective weapon. But it gave me an idea. I again dressed for battle. I found my racquetball racquet in the garage and I went to war. It took a little while to get the feel for it, but for over an hour I did hand to wing combat with the swarm of Cicada Killer Wasps. In the spirit of Luke Skywalker, I swatted the attacking hordes down with my Jedi skills. They continued to show up throughout the day. Like a soldier of Nehemiah, I worked with a screw gun in one hand and my racquet in the other. I struck down the enemy while my family safely watched in hysteria safely from inside the house. I’m sure it looked ridiculous to the neighbors, but it had to be done. I was tired of talk, smoke and foam. I needed results. What are the Killer Wasps in your life? Are there habits, people or places that you need to eradicate from your scene? Stop doing things that wont work. Do you need to get serious about a new job or new relationships? Do you need to get your body in shape and your health on track? It may be time for you to get your Skywalker on and go to war. May the Force be with You.